The production of foodgrains depends fairly closely on the amount and distribution of monsoon rainfall over the country. Further the generation of hydro-electric power from monsoon rain water has been traced over the last 20 years. While hydro-electric power constitutes about 40% of power from all sources, with proper surveys and planning additional hydro-electric power projects this percentage could, perhaps, be further substantially increased. The distinct advantage of hydro-electric power over all other types of power is that its source, i.e. monsoon water, is perennial, although it shows some fluctuations from year to year. The power of the monsoon winds at four and two stations on the West coast and in the interior resp. has been assessed on the basis of five years hourly wind data. The wind at New Kandla on the West coast has a good potentiality for power. The wind power could be used for electricity, grinding corn and drawing water. On the debit side, Indian economy suffers heavy losses due to floods and droughts almost every year. Earlier this year, the India Meteorological Department (IMD) had predicted the country would get normal monsoon rains in 2017. The state-run weather body last week said India’s annual monsoon rainfall is expected to be 98% of the long-period average (LPA), up from 96% projected earlier, raising prospects of higher farm output and economic growth. The forecast has a margin error of 4%. The monsoon is considered normal if rains in the June-September season are between 96% and 104% of a 50-year average of 89 cm. The monsoon rains arrive on the southern tip of Kerala by around June 1 and gradually covers a major part of the country by mid-July before retreating by the end of September. The IMD has predicted seasonal rainfall this year to be 96% of LPA over northwest India, and 100% of LPA over Central India. Rains in the southern regions are likely to be 99% of LPA while precipitation in north-east India will be 96% of LPA in the four-month period. All projections have a margin error of 8%. Rainfall in July and August, crucial months for crop sowing, over the country is expected to be 96% and 99% of LPA, respectively, both with a margin error of 9%. India Ratings said the spread of monsoon over space and time is also forecast to be normal and that bodes well for agricultural output. 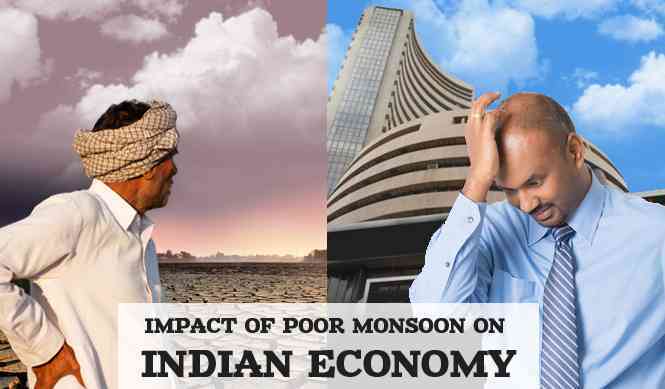 The monsoon has a direct impact on the country’s agricultural GDP. The planting of key Kharif, or summer, crops like rice, sugarcane, pulses and oilseeds begins with the arrival of monsoon rains in June. A deficit monsoon could also lead to a drought-like situation, thereby affecting the rural household incomes, consumption, and economic growth. Whereas a normal monsoon results in a good harvest, which in turn lifts rural incomes and boosts spending on consumer goods. It also has a positive impact on hydropower projects.